The below is the another in our now regular summaries of this week’s First Minister Questions session from Cardiff Bay. 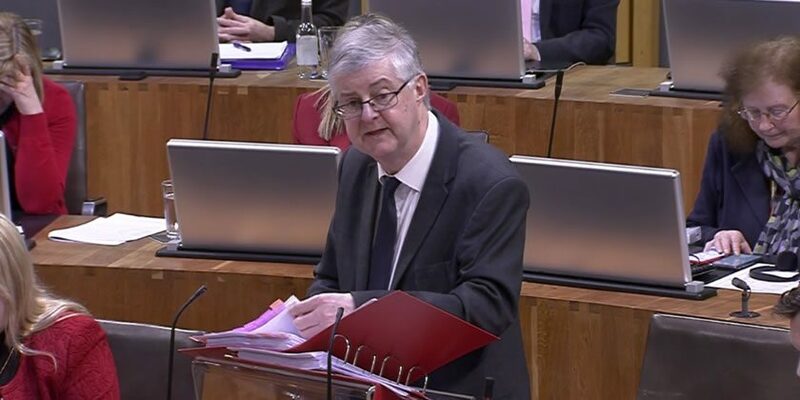 First Minister Questions takes place every Tuesday when the Assembly is sitting and can be watched live via Senedd.tv. For those who have never ventured onto the Senedd site, you can view the session the below was taken from here, that displays a video of the meeting (along with creation of your own clips!) plus by clicking the ‘meeting information and papers’ link you are able to view all the supporting documentation, along with a link to the full transcript. Wrexham got several mentions, with the opening of Frugalpac manufacturing facility that produces fully recyclable coffee cups getting a passing reference, the town got the most mentions on a topical question over football. The First Minister replied, “Thank you, Llyr Gruffydd, for that question. What he says is true: when you mention Wales throughout the world, people immediately think about sports, and that’s the first thing people think about when they think of what happens here in Wales. Turning to Kurdish hunger strikers (there’s a debate on this tomorrow) Adam Price AM asked what the Welsh Government’s position was? The First Minister gave a non-committal answer which boiled down to “wait and see” ahead of now-yesterdays debate. Following the recent publication of a Health Inspectorate Wales report into Cwm Taf health board maternity services, Leader of the Opposition, Paul Davies AM (Con, Preseli Pembs. ), asked if mothers and babies were put at risk?